Museum of Material Memory considers the privacy of the information collected from the users of this website (www.museumofmaterialmemory.com) to be of utmost importance and follows a strict policy to protect the information. This policy lays down the practices and procedures that we follow in collecting, storing and handling the information provided by users of this website. 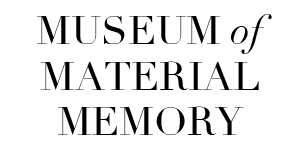 Museum of Material Memory collects demographic details like names and emails only when a user submits a story or subscribes through the website. Browsing of the website is anonymous and doesn’t register the user’s personal information except the time, date and place of visits and the name of internet service provider. This information is not shared with any third parties or external agencies. By contributing to the Museum, users are agreeing to their content being used in publications, articles, presentations and exhibitions for the purposes of promoting the project in any existing and future media with proper copyrights and credits. Any special circumstances requested by the user while submitting the story will be adhered to. Subscribers will receive regular email updates as and when new stories are archived by the Museum. Museum of Material Memory follows security practices and procedures that are consistent with international standards. We follow well defined administrative, technical and physical security control procedures to provide reasonable protection to information provided by the users.